The friendly face and the slim silhouette of the Dutch soprano Julia Westendorp make her particularly suited for soubrette roles. Her trough and trough charming and energetic voice, supported by a clear diction and a well balanced vibrato, is the material for a sovereign Susanna. With a fruity strong and agile voice, Julia Westendorp portrays a sympathetic Susanna. 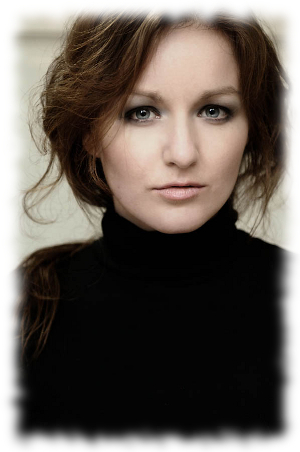 Julia Westendorp (beautiful voice, pretty face) has the timbre and stature of Pamina. Karin Strobos and Julia Westendorp show also vocally their vivacious spirits. In the smaller parts we heard convincing Dutch singers such as Karin Strobos, Henk Neven and Julia Westendorp. ...Julia Westendorp comes forth as a little female Tarzan, running across the island while at the same time managing to sing genuinely beautifully. Of the love couples, Enrico (Martijn Cornet) and Silvia (Julia Westendorp) convinced me the most. Very skillfully, Westendorp portrayed a naive young girl, clearly brought up in the wilderness. She amazed with agile dance and acting skills. (...) The soprano also accounted for most of the humouristic scenes. Moreover, she had brought her clear and delightful voice from the Schöpfungsmesse with her into the opera. The role of the unshakeably calm new prioress Mme Lidoine calls for a dramatic soprano and is being sung by Julia Westendorp. Movingly and with admirable purity she sings her aria at the end before the finale. Julia Westendorp, singing purely and beautifully, captured the hearts of the audience.